The 1957/1958 standard model (F3.144 engine, diesel), blue/orange, with horizontal (underswept) exhaust. The 1957/1958 standard model (F3.144 engine,diesel), blue/orange, with vertical exhaust. The 1958 industrial model (F3.144 engine,diesel), blue/orange, with horizontal (underswept) exhaust; this Dexta was finished by County Commercial Cars at their Fleet factory. It had a hydraulic braking system, front-wheel fenders, rear-view mirrors and came standard with lighting and a speedometer (which were optional at the time on the agricultural Dextas). These adaptations permitted the tractor to operate on public roads on non-agricultural licenses. The 1958/1959 petrol Dexta, blue/orange, with vertical exhaust (see below for further details). The 1960 restyle (F3.144 engine,diesel), blue/orange, with vertical exhaust; this Dexta had the headlights incorporated into the grille. Also, the side Fordson Dexta decals on the bonnet first appeared (before then, only the nose decal was used). All tractors came with vertical exhausts from now on. From April 1962 onwards, Simms Minimec fuel pumps were used. The 1962 Super Dexta (F3.152 engine, diesel), blue/orange; the Super Dexta emerged with a different nose bonnet and had more power due to its bored-out engine. The 1963 standard model (F3.144 engine, diesel), blue/grey; the first Dextas with the blue/grey colour scheme. 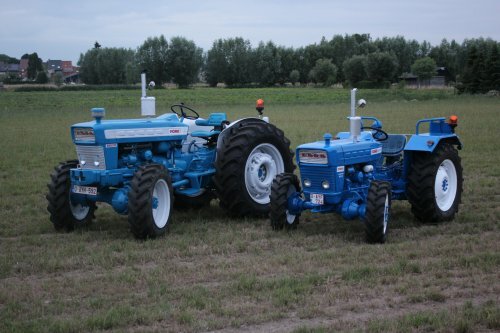 The 1963 new performance Super Dexta (F3.152 engine, diesel), blue/grey; these had their output power increased to 44.5 HP due to increased engine revolutions up to 3,000 rpm. They were only made from June 1963 until September 1964. The Diesel 2000 for US export - this is the name given to the Super Dexta in the USA. The 1963 Dexta Special (Germany only); this Dexta was specially made for the German market. It featured broad rear-wheel fenders with a seat, direction-indicators, horizontal (underswept) exhausts and decals reading Fordson Dexta Special. There were also a number Super Dextas made for the German market with the same characteristics. The Manuel/Roadless 4WD Dexta; see below for details or click link. The Narrow Dexta; this one had a minimum width of only 52" and a maximum of 76".